This page is devoted to my favourite shops and products. I'll update as I find more things to love! I tend to try and buy my jewellery in sterling silver as I hate tarnishing. I would rather have fewer items of a higher quality, always. Things I look for in jewellery include resemblance to weaponry (preferably medieval, but I don't discriminate), mythological/natural/historical/horrific inspirations, unusual body placement, and a healthy dose of Goth. I seldom wear gold jewellery as I prefer and suit silver, but I still have a fair bit of it as change is fun. Other loves include pewter, cameos, marcasite, semi-precious and gemstones, chokers, anatomy and crucifixes. My other favourite! The ultimate in luxury jewellery, and a go-to for my family when it comes to my birthday and Christmas! Expensive, yes, but precious forever. Unusual silver jewellery inspired by nature and mysticism. A gorgeous selection of handmade luxury items, inspired by nature and history. Lovely Victorian pieces, gemstones, bangles worthy of a Viking hoard ... An absolute must. More fashion-forward jewellery, and some sterling silver at good prices, mostly with a dark aesthetic. The best chokers at brilliant prices, and unparalleled service! This is where I buy my silver above-knuckle rings. Well-priced sterling silver in pretty designs. Weird and wonderful horror jewellery, because zombie necklaces are essential. These pieces are really for fun! I love this brand for their pretty 'Cameo' range of necklaces. They are cute and eye-catching. I am tempted to just type 'BLACK' here. ^_^ I tend to wear mostly dresses and skirts, and like very dark colours with the occasional surprise. I'm drawn to textures and intricacy in particular, and as I come from a dressmaking household I always look for quality. Velvet, lace, beading, satin and chiffon are my preferred fabrics, though my favourite casual outfit is a cool T-shirt and shorts. I like my clothes to reflect my interests. TK MaxxAbout 50% of my wardrobe comes from this shop. I love the hunt! My favourite high-end high street shop. I love their mix of glamour and grunge with a dark palette running through. AllSaints on crack. They were founded by the same people, and I absolutely love their designs. Still expensive, but they do great sales. The high-street store I shop in most -- it's essentially my Primark, as I can't stand that place! I love their Divided section for casual wear, and they do awesome sportswear as well. Their main range has pretty, classy workwear and the occasional gem. My favourite high-street shop. 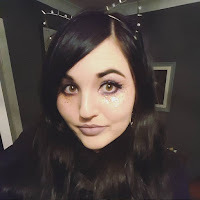 My style isn't trend-led at all, but I always find some suitably Goth things in Topshop, and I love their jewellery, accessories and pyjamas! And now, my favourite online shop! ASOS' range is vast and a bit daunting, but I always see something I like and again, their sales are insane! I love the variety that's on offer, and the quirky own-brand styles. Shoes are my favourite thing to buy, particularly black boots. I'd say 80% of my shoes are black (I won't say how many pairs that is). I don't like spindly high heels as they hurt; I do like wedges, block heels, and crêpe soles. Brothel creepers are my one true love. Underground for the sturdiest, clumpiest, wonderful-est brothel creepers, and steel-capped boots. Office for an amazing selection of brands as well as a competitive own range (and awesome sale!). Jeffrey Campbell for credit card debt. Converse, Vans, and DCs for throwback delights. Chloé for my first and only pair of designer shoes. Now that I'm a home owner, there are even more things to spend my money on ... Here are some of my usual haunts. Unfortunately there's no online shop to link to here, but I love TK Maxx for unusual homeware. Past finds include metal skulls, a bell jar, and Hello Kitty bathroom scales. The dreamiest. We don't have a store in Scotland, and online delivery is really expensive, but I just love their beautiful things! After a surprisingly Gothic homeware collection caught my attention, I've been a fan of Wilko as their quality is more than decent for their low prices! They do great deals on towels that come in all colours.